The Leaderboard will be published once a month, and the answers given between beginning and end of respective the calendar month will be scored. 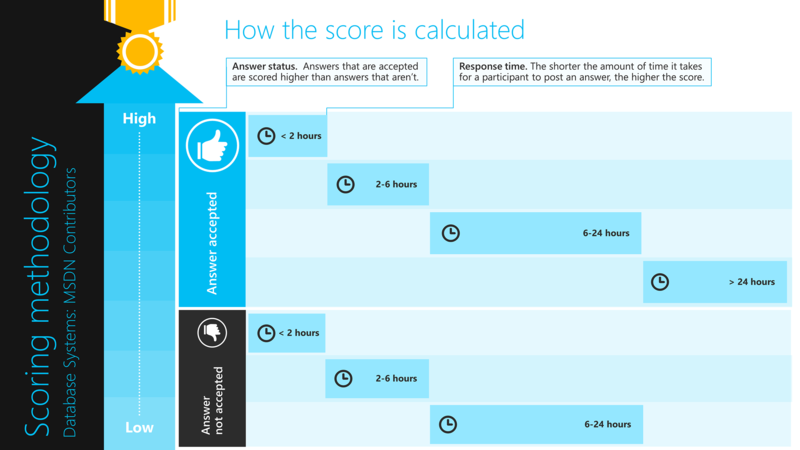 For example, answers given between 00:01 September 1, 2016 and 23:59 September 30, 2016 are considered for the September 2016 ranking. The leaderboard is shared among all members of the community, including Microsoft employees and affiliates. The All Database Systems leaderboard is based on all forums related to Microsoft’s Database Systems products and services. 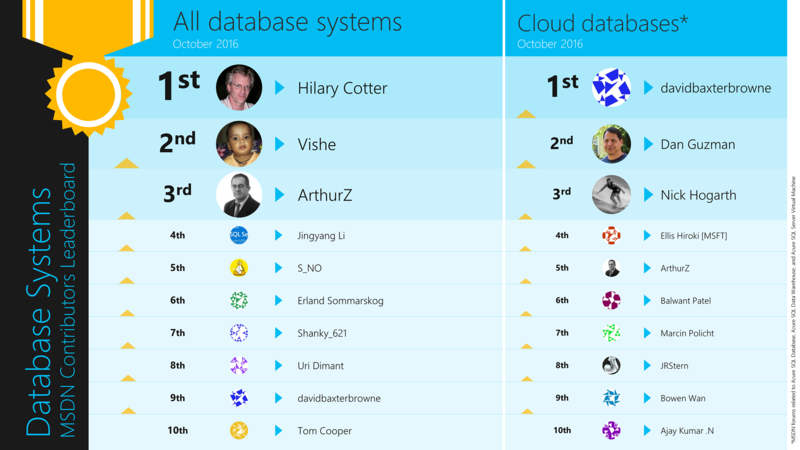 The Cloud Database leaderboard is based on forums related to Azure SQL Database, Azure SQL Data Warehouse and SQL on Azure VM. The leaderboard will soon operate from its own webpage. We thought it would be a good idea to publish the October 2016 Leaderboard as a pilot, while the website gets ready. Congratulations to the members who made it to the October 2016 leaderboard! 1. What if there are multiple answers? What if there are multiple answers accepted? All answers will get the same points. 2. What if I give the answer in a particular month and it gets accepted in another month? You get points for unaccepted answer in the month of answering, and the additional points for answering in the month of acceptance. 3. How do I find my own score on the leaderboard? The leaderboard will get its own website soon where all members of the community can find their monthly scores. For the pilot, we plan to publish the names of the Top 10 contributors. 4. Which questions count within these forums? All questions within the forums related to SQL Server, Azure SQL Database, Azure SQL Data Warehouse, SQL Server VMs on Azure will have equal weighting. 5. MSDN already publishes a leaderboard. How is this different? We find that Database Systems related questions require a specific and unique skillset compared to all other MSDN forums. This is an effort by the product team to recognize people who make use of this special skill set for the greater good of the community.